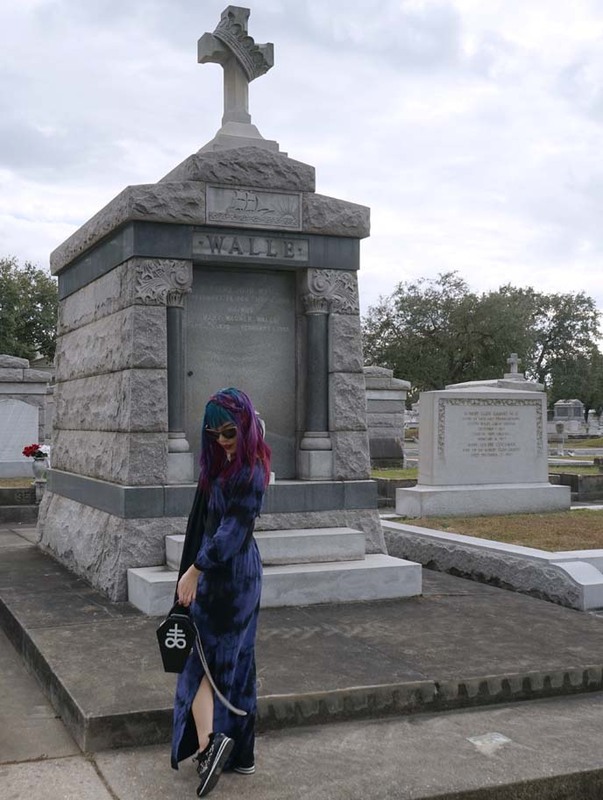 Graveyard Goth! 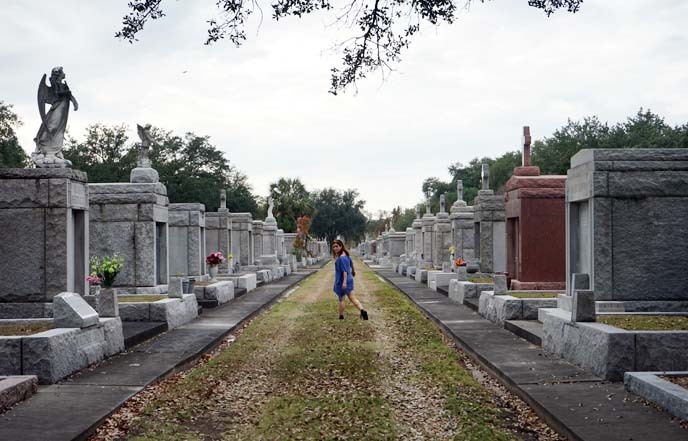 Lake Lawn Metairie Cemetery, New Orleans. Egyptian Sphinx pyramid tomb, Weeping angel statue. 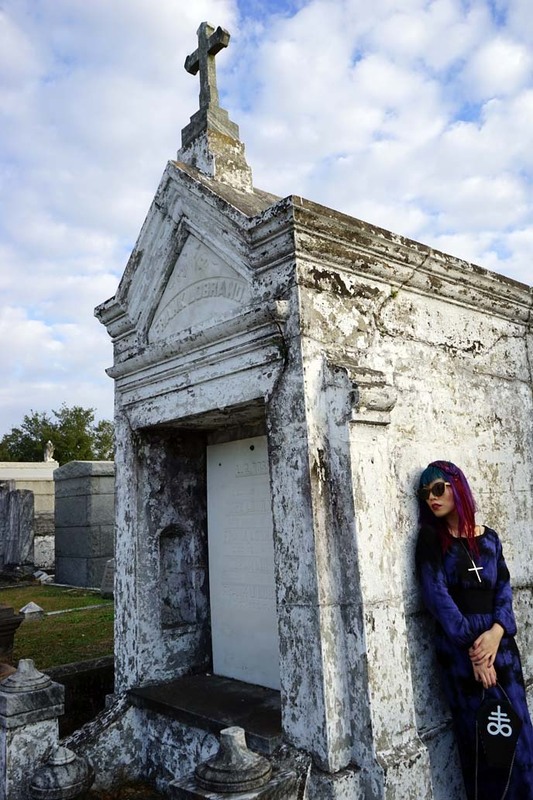 Every Goth who goes to New Orleans is naturally drawn to the graveyards here. 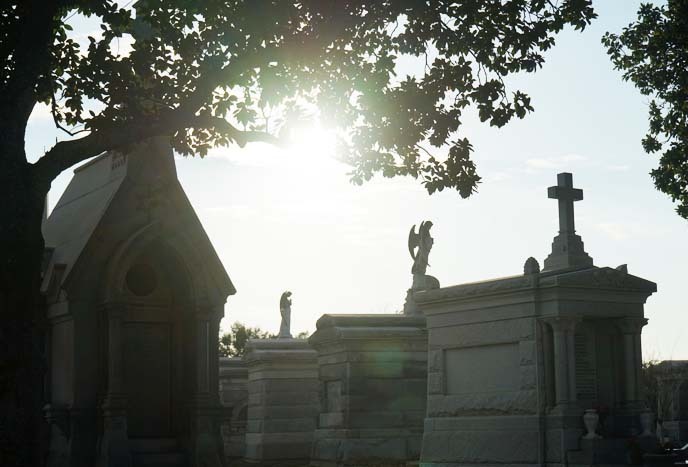 St Louis Cemetery is the most famous one, and home to the tomb of voodoo queen Marie Laveau. 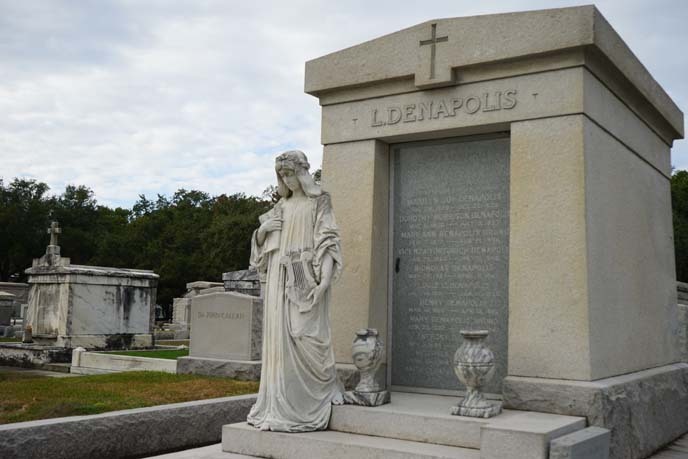 However, I’m going to take you on a tour of a lesser-known but more fascinating resting place: Lake Lawn Metairie Cemetery (5100 Pontchartrain Boulevard, New Orleans, LA). 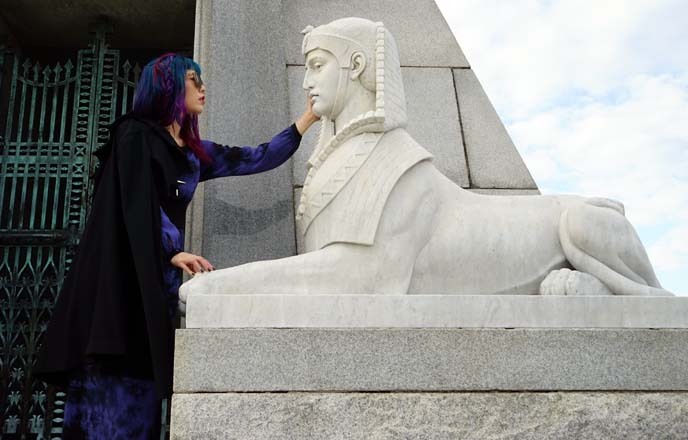 … and kissed the Egyptian Sphinx. 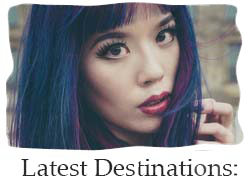 Read on, and we’ll take you to the Weeping Angel (as seen on the cover of Nightwish and Evanescence albums), and more marvels. 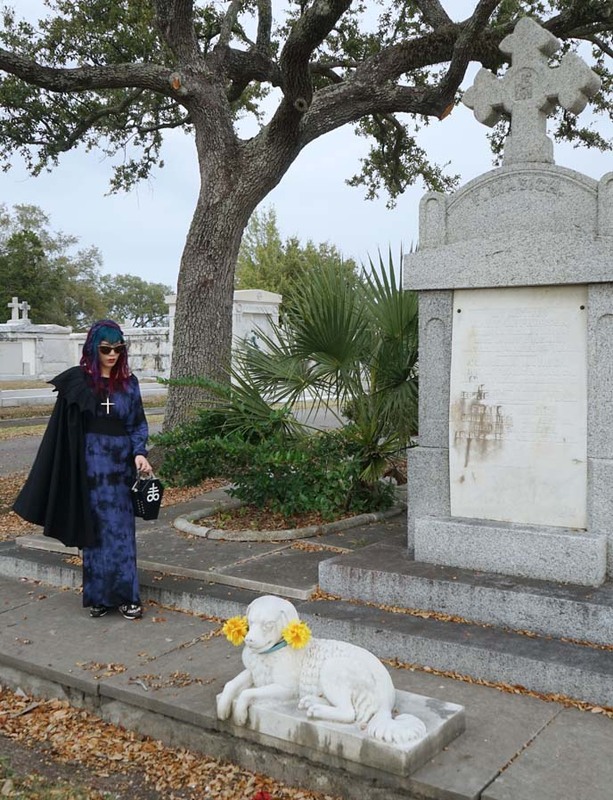 If there’s one place where a vampire cape is appropriate attire, it would be a graveyard in New Orleans. Mine is by Black Peace Now, a Japanese brand (so it’s well made, not a costume piece). 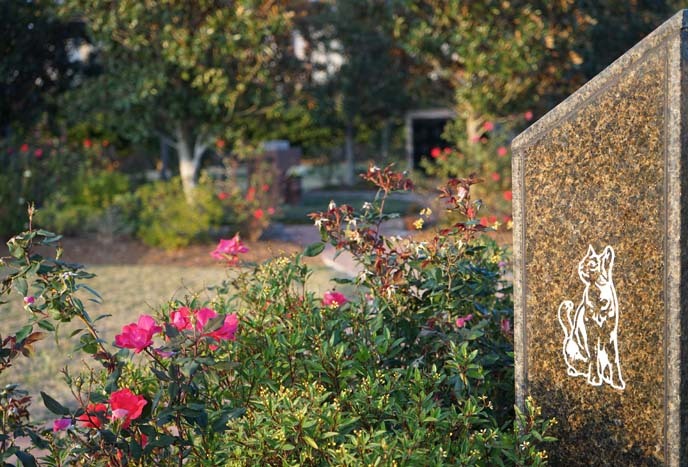 I enjoyed walking quietly down the well-manicured paths, and noticing small details like this butterfly headstone. 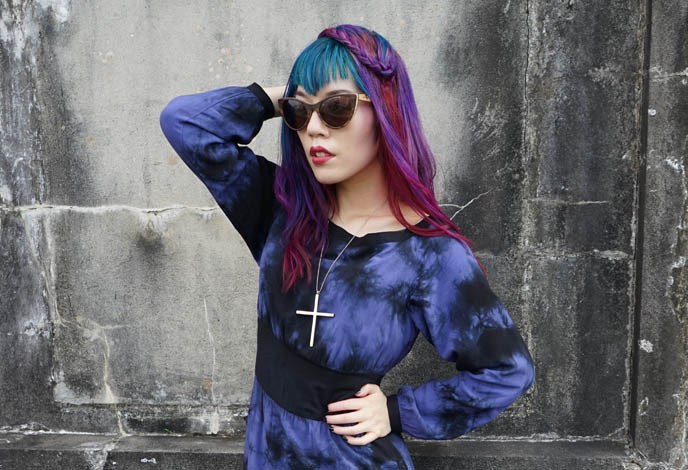 Details of my purple-blue-red hair, braided at the top to show the colors. 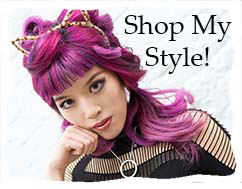 My hairstylist is Stephanie Hoy, at Stratosphere salon in Vancouver, Canada. 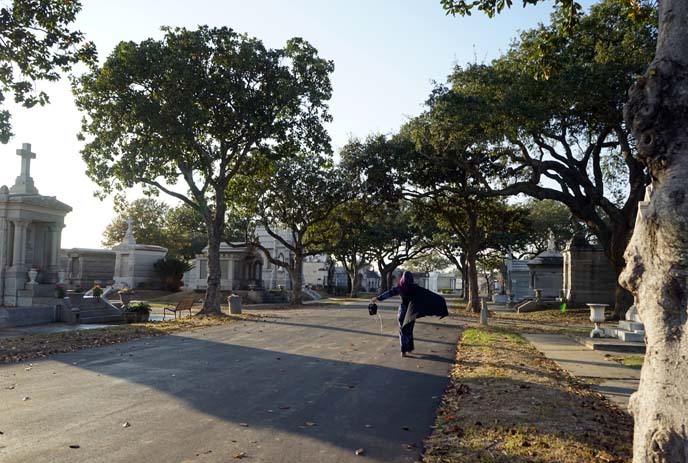 The cemetery is enormous. 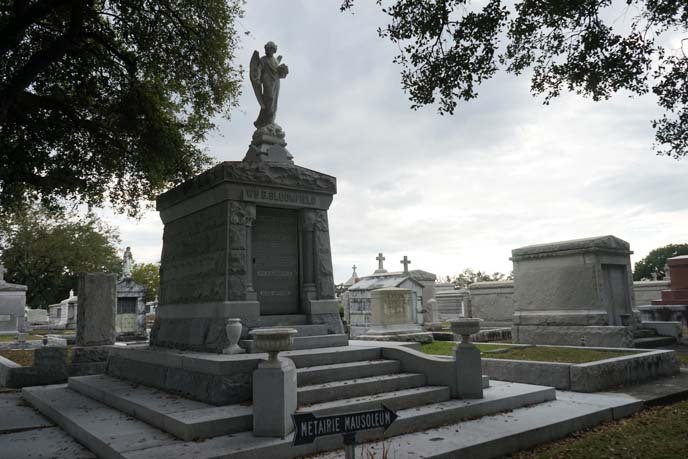 It’s not located in the city of Metairie, but within NOLA city limits (about a 30 minute taxi ride from the French Quarter). 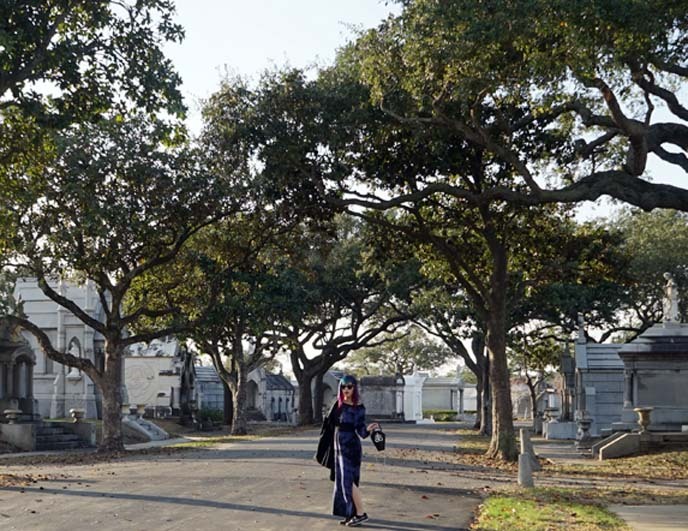 The cemetery was once a horse racing course. 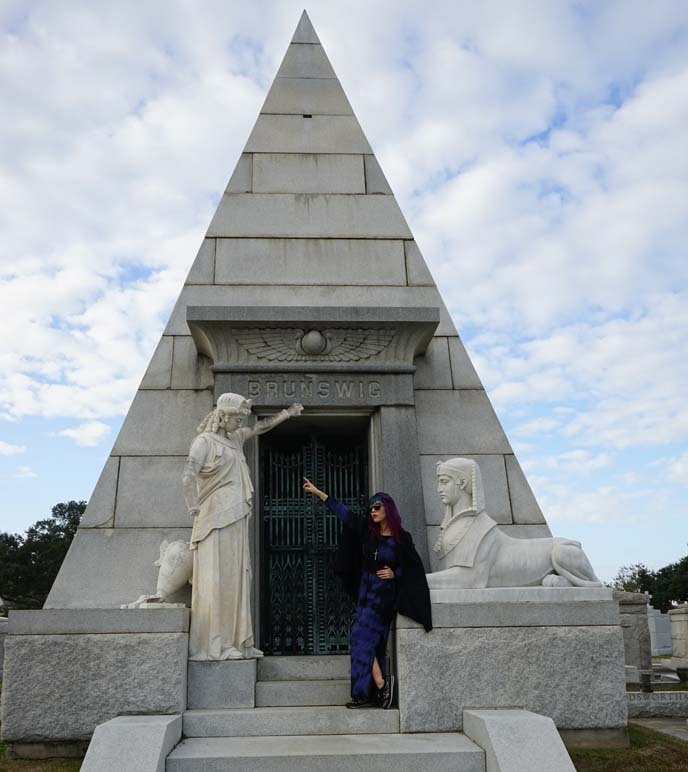 In the late 19th century, it turned into the final resting place of notable and wealthy locals. 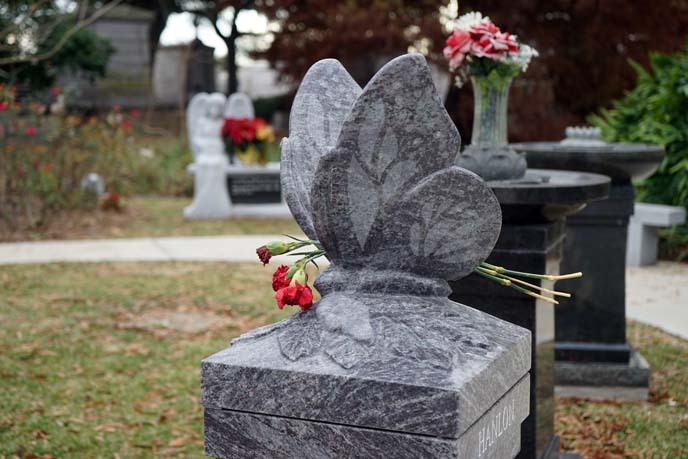 At first glance, the white marble mausoleums look similar. But the closer you look, the more you see. The staff told us that there are about 10 different types of crosses gracing the roofs. Above is one with a crown. 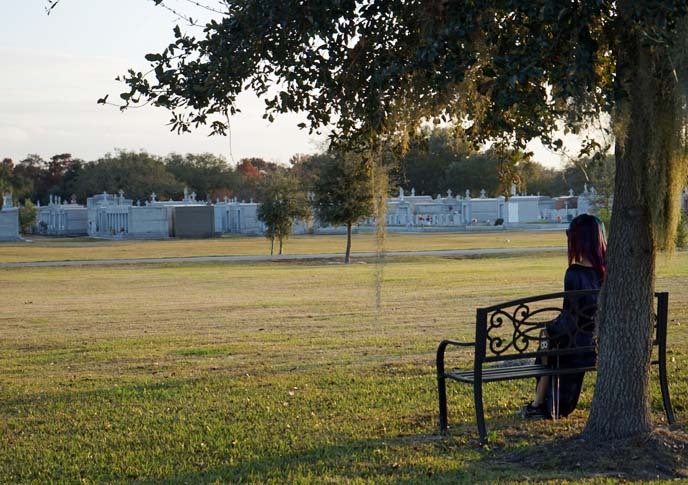 The atmosphere at Lake Lawn Metairie wasn’t sad or eerie. Instead, it felt like a peaceful space for reflection. 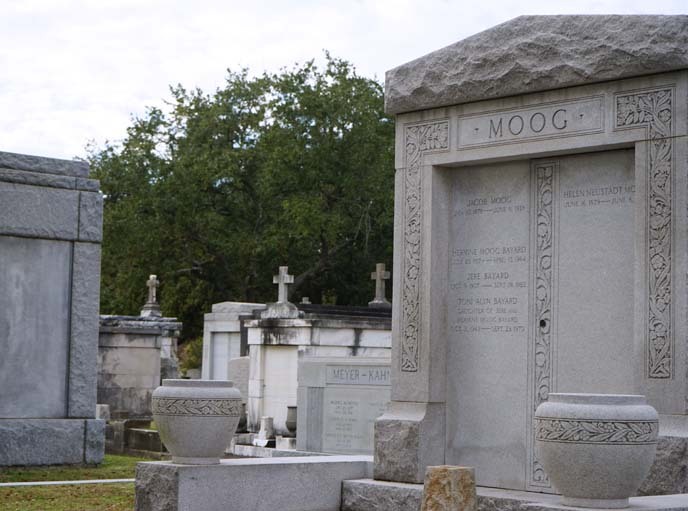 I admired the intricate carvings on this tomb (the family is not related to the Moog synthesizer, though they share the name). At Avenue D, Plot 113, we found what we were looking for. 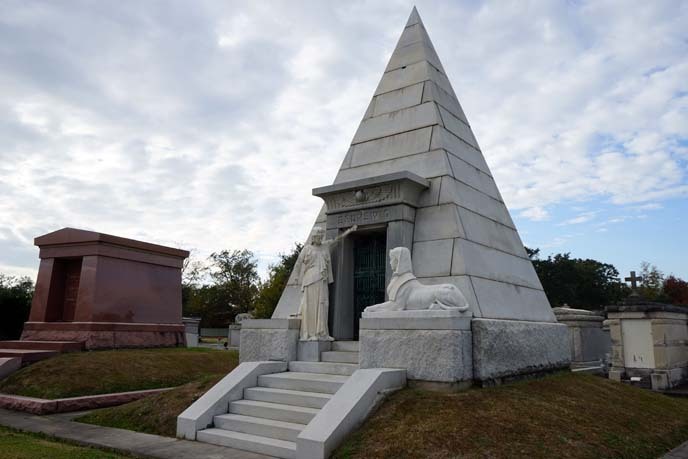 This is the Lucien Napoleon Brunswig tomb, shaped like an Egyptian pyramid. Brunswig (1854-1943) founded a large pharmaceutical company. 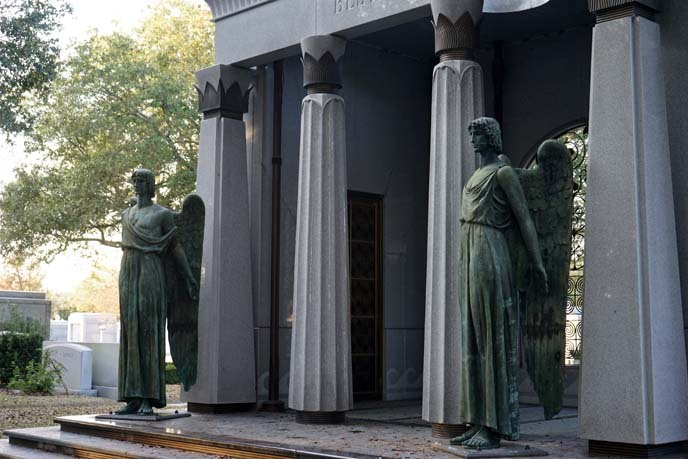 I’m not sure why he chose to have such a unique and striking tomb. 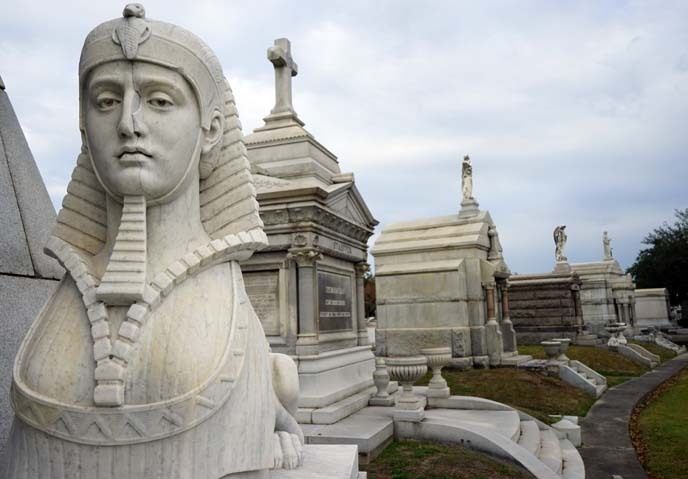 There isn’t any other design like this in Metairie (although actor Nicholas Cage erected a pyramid for himself in Saint Louis Cemetery). Practicing my disco moves, to match the guardian on the left. She points to a Winged Sun, surrounded by two cobra snakes. This ancient Egyptian symbol is associated with divinity, royalty and power. There’s something uncanny about this Sphinx, who wears the royal “nemes” striped headcloth. When you look in his eyes, it is as if he stares back. I haven’t sensed this with any other statue. He’s the keeper of riddles and mysteries. Who carved him? Why? Is the crack down his nose intentional? An accident, or tribute to the noseless Great Sphinx of Giza? I don’t know. (If anyone holds the keys to these mysteries, please let us know in the comments). All we can say for sure is that the Sphinx deserved a kiss. 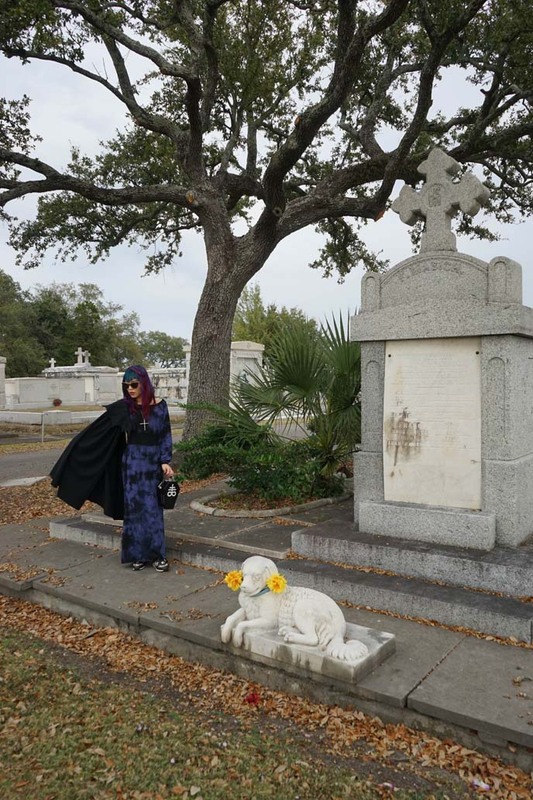 Our friend Cynthia did this first, and inspired us to make the same pilgrimage. Perhaps you’ll come here too, and add another peck to his lips. 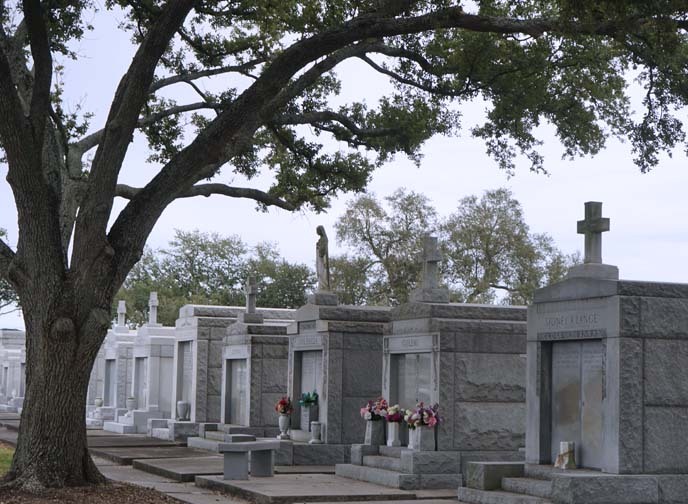 Metairie has the largest collection of funerary statues in the city. I could have wandered here for hours. 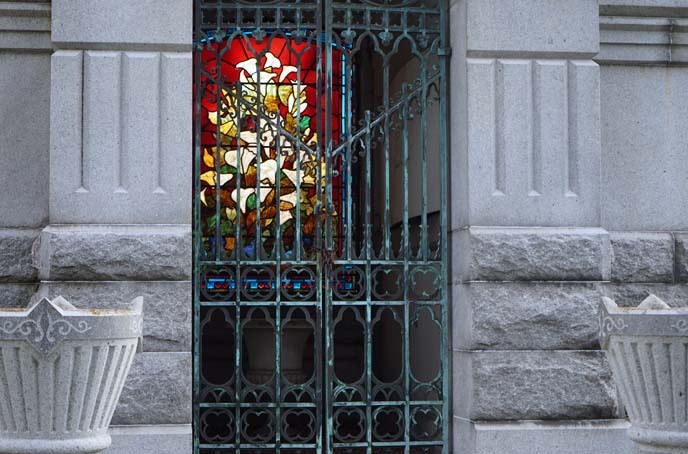 Some had colorful stained glass windows. Some plots were empty. Some had fresh graves. Others were dark and crumbing. 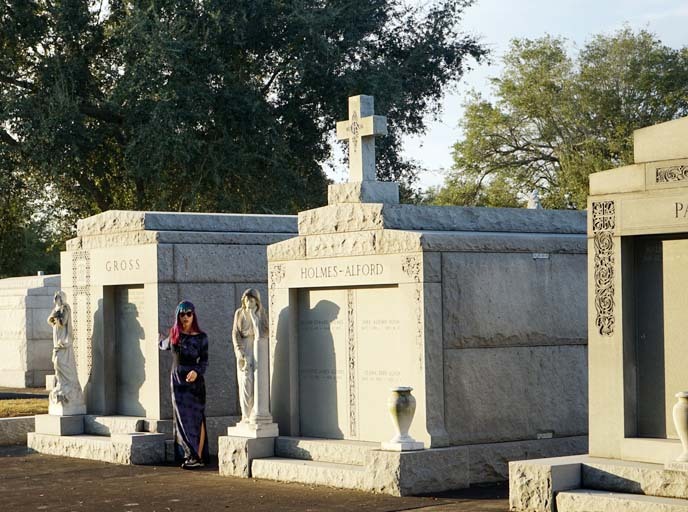 For the most part, however, the tombs were strikingly well cared for. 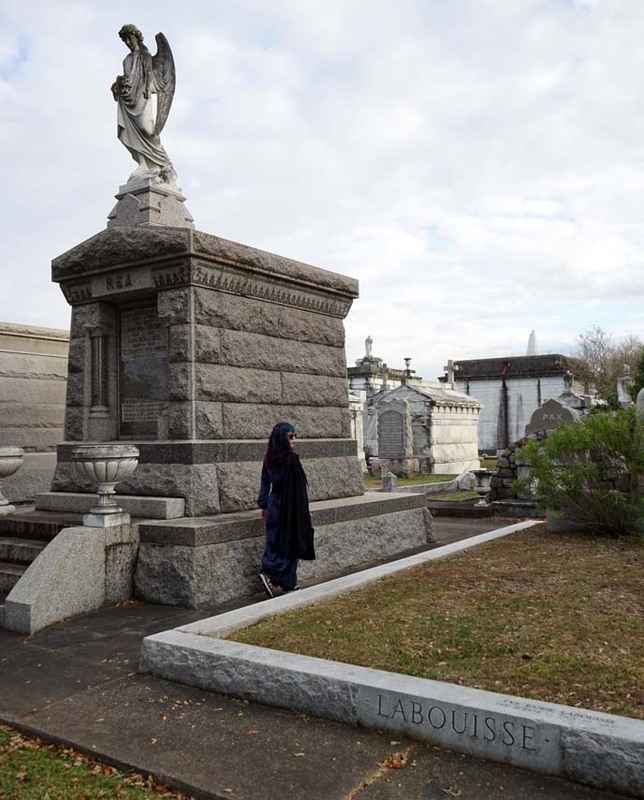 This doesn’t at all feel like a tourist destination (unlike Saint Louis Cemetery, where you’ll see groups going on guided tours). 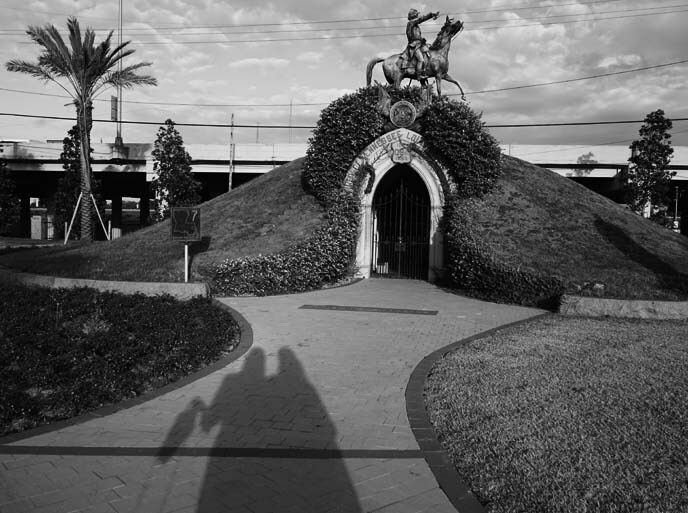 Our shadows approach the Army of Tennessee memorial. This monument honors fallen Confederate soldiers of the American Civil War. 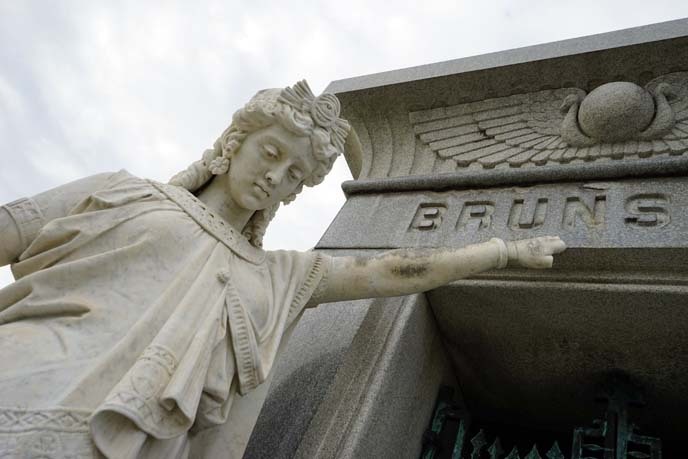 This “Angel of Grief” is modeled after the 1894 sculpture by William Wetmore Story. 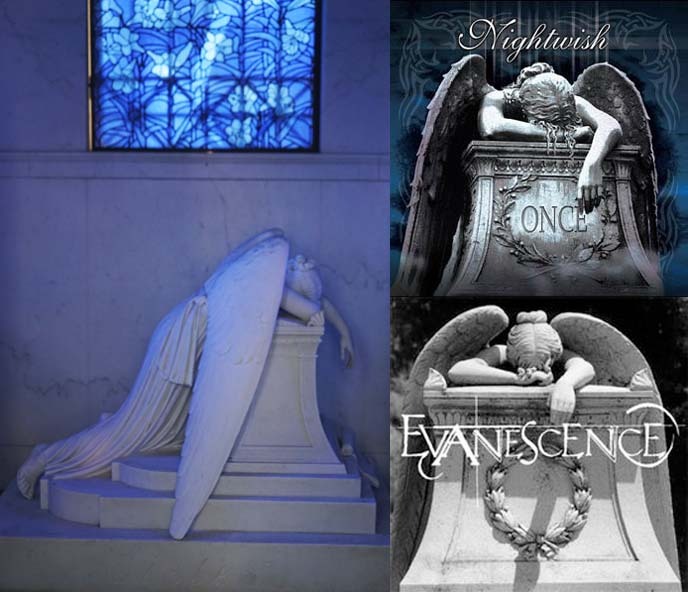 You might recognize this moving image from the album cover art of Goth bands, Evanescence and Nightwish. … and stand on guard at the entrances. As you can see from the photo above, some of these memorials are the size of a house. 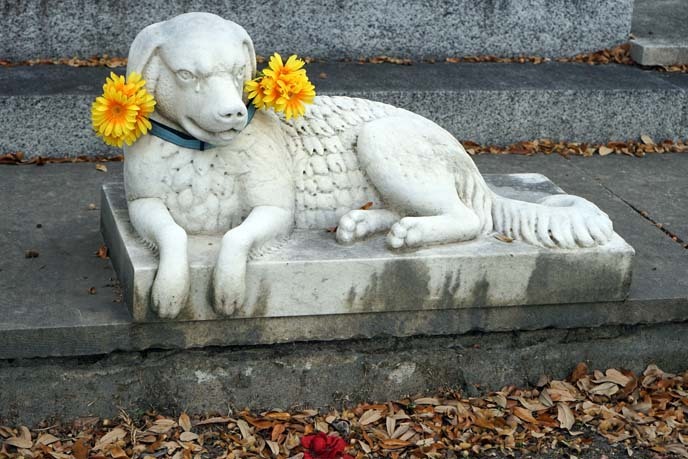 A buried family, guarded by their faithful dog who holds fresh flowers. The dog is shedding tears for the dead. 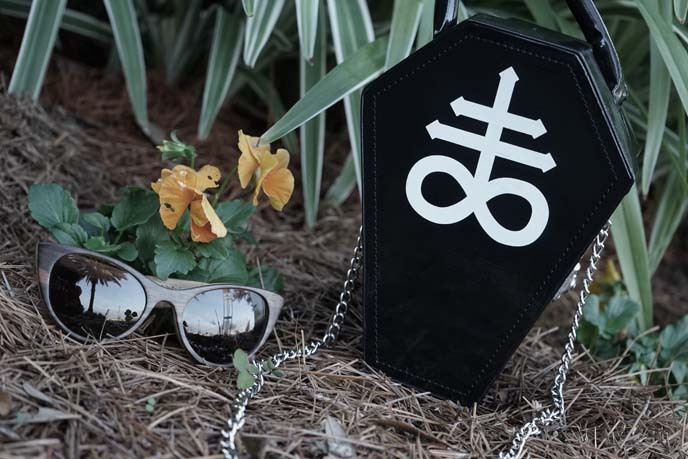 Details of my wood Moat House wood sunglasses, and Killstar coffin purse. 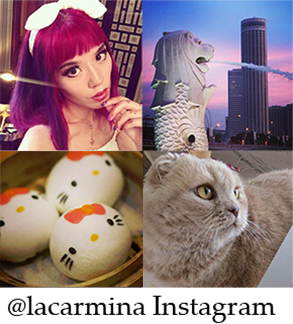 Believe it or not, this was one of my favorite travel experiences of 2014. It’s hard to describe, but I think Molly expressed this feeling well at the beginning of this post. 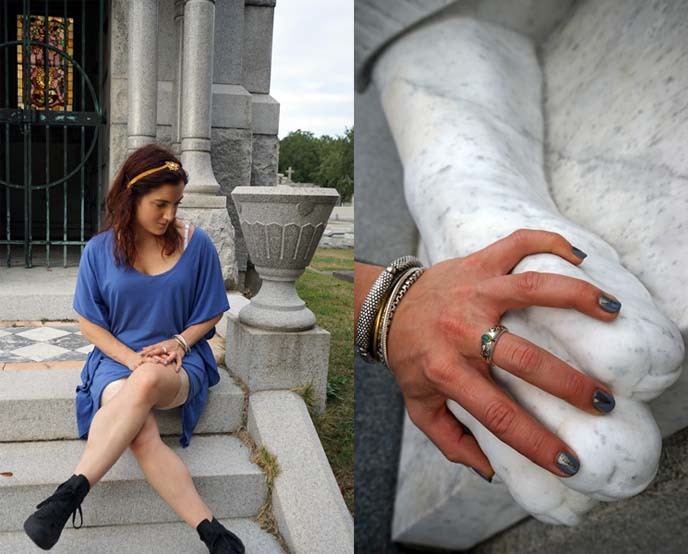 Standing by tombs from the 1800s, we felt like we were part of the same human experience. 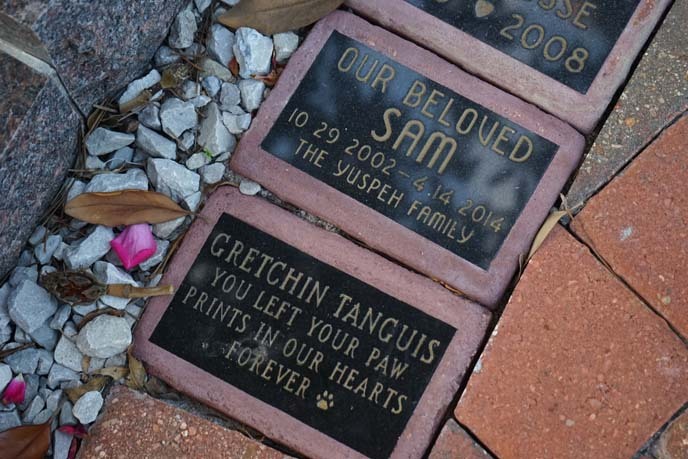 On the other side of the lawn, there’s a garden and Heaven’s Pets. Thoughts upon thoughts, as the sun began to set. And then I spread my vampire cape, and flew away. Loving your spotlight on the hidden facets of such a famous destination. 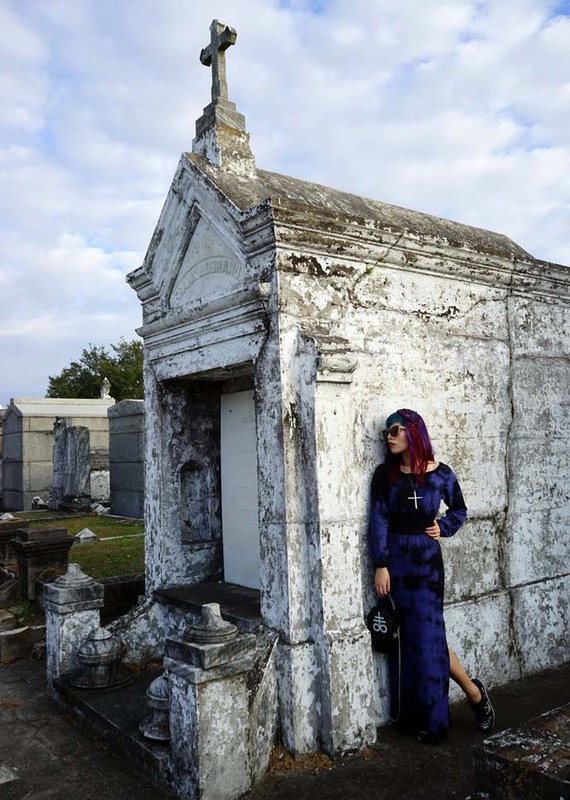 What a mysterious and unique cemitery! Those sphinx eyes… They look alive. It’s so beautifully carved. It was eerie, looking into the Sphinx.. felt like I was in another dimension. 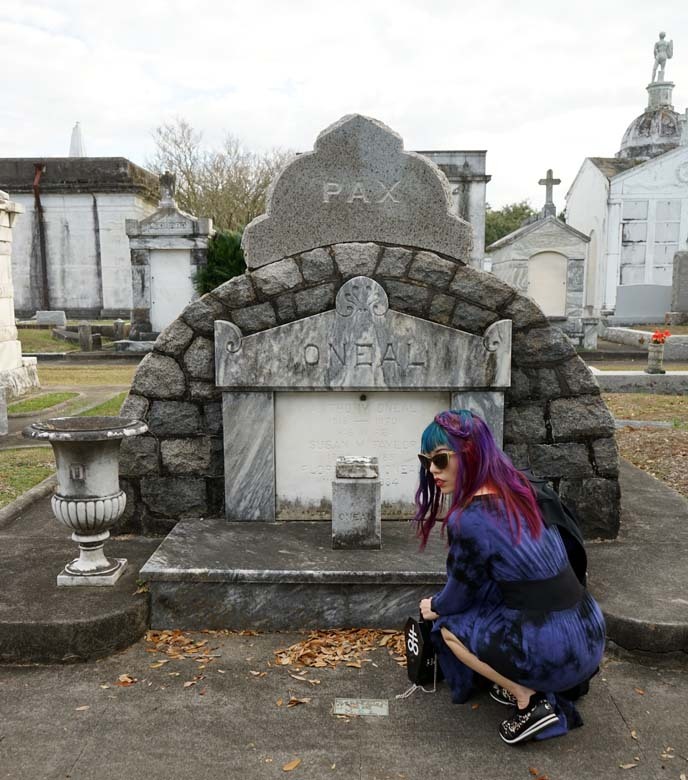 NOLA is a place I could visit over and over. Beautiful purple dress! And very goth setting ;) Love it! marvelling at the size of it. Thanks for sharing.